Honor 7X Exchange Offer on Amazon.in – Hello Guys, Thinking of Exchanging your Old Smartphone with New, Then this is your best chance. 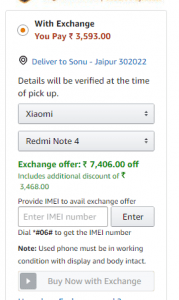 Amazon is Offering Honor 7X or many other Phones at Just Rs.1000 Minimum, For example, if You have Redmi Note 4 Yu can get it For Rs.3599 Means giving Exchange Value of Rs.7700 So Loot Lo Guys, I am not Wasting Time else it will go out of stock. First of All Visit Honor7X Offer Page or Search for other Phones. 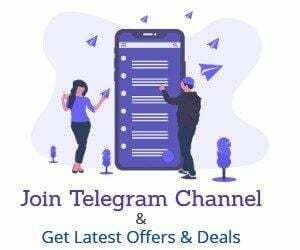 Now Select buy with an exchange. Enter IMEI number & Discount will be Applied. Now Place the order at Discounted Price. Now sit relax, you will get Your New Phone at your doorstep soon. You need to give the old Smartphone at the time of delivery. It’s not working crt is showing empty. Well that was fast. Did you get one?And how to search for sales like this on Amazon app?